In 1965, the Nebraska Legislature created the Educational Service Unit system to provide supplemental services to school districts. ESUs are service-oriented, non-regulatory agencies designed to achieve a better balance of educational opportunities for students regardless of the population, financial differences, or geographic limitations of school districts. The governing unit consists of an elected board of 9 members. Members are elected for four-year terms from nine distinct election districts. Meetings are conducted at 7:00 p.m. on the third Monday of each month. Educational Service Unit 10 utilizes an advisory committee structure for the purpose of receiving feedback and developing recommendations for services that are provided to schools. Local school administrators and county superintendents are elected by their peers to serve on the Administrator Advisory Committee, which meets at least four times during the year. The recommendations of the committee are considered by the school districts in the ESU 10 area. Once two-thirds of the school districts that contain at least one-half of the student population approve the administrator advisory committee recommendations, the Board of Directors makes the final decisions concerning the program of services for the unit. 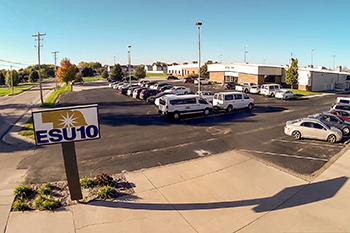 Educational Service Unit 10 employs 106 staff members who provide services to students in the counties of Blaine, Buffalo, Custer, Dawson, Garfield, Greeley, Hall, Howard, Loup, Sherman, and Valley. Included in these counties are 34 K-12 districts, 2 residential schools and 10 parochial schools. The area served covers approximately 9,325 square miles and includes an estimated 29,500 students in grades K-12.